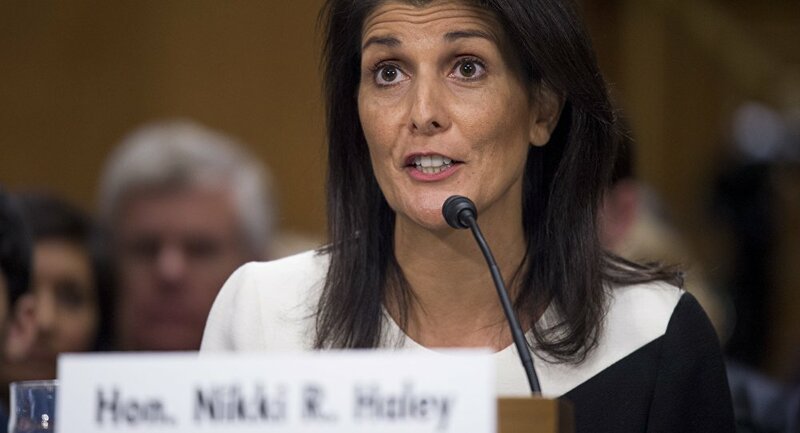 Following a massive US strike on Syrian targets on April 17, US Ambassador to the UN Nikki Haley said during UN Security Council meeting that Washington was "locked and loaded" to conduct new strikes against the war-torn Middle East country. US Ambassador to the UN Nikki Haley told CBS that Washington was preparing new sanctions on Russia over Moscow's support of the Syrian government, adding that the measures would be announced on Monday. According to her, the new restrictions will affect companies that are allegedly "dealing with equipment related to Assad and any chemical weapons use." "And so I think everyone is going to feel it at this point. I think everyone knows that we sent a strong message and our hope is that they listen to it," Haley said, answering a question about potential US response to the Russian support to Syria. Despite the fact that Syria had destroyed all of its chemical weapons' arsenal several years ago, which has repeatedly been confirmed by international monitors, Haley also accused the Syrian government of making the use of chemical weapons "more normal and that Russia was covering this up, all that has got to stop." In a separate interview with Fox News, Haley said that the United States was not going to pull out its troops out of Syria until its goals in the country were accomplished. She listed three main aims for the US: ensuring that chemical weapons are not used in any way that pose a risk to US interests, that Daesh* is defeated and that there is a good vantage point to watch what Iran is doing, speaking on Fox News. She said that Washington's main goal is "to see American troops come home," but it is not going to leave "until we know we have accomplished those things." She went on to note that Washington will not hold direct talks with Syrian President Bashar al-Assad and added that the US ties with Russia are "very strained," in part because of Syria, but the US still hopes for the better relationship. Earlier, US President Donald Trump stated that he wants to get US troops out of Syria relatively soon, but that they would have to stay a little longer to helpfully defeat the Daesh terrorist group there. The statement comes as on Friday night, the United States, France, and the United Kingdom launched airstrikes on a number of targets in Syria in response to the alleged chemical incident in the Damascus' suburb of Douma. The Western states have accused the Syrian government of an attack with the use of chemicals in Douma. The Syrian leadership denied involvement in the attack and invited the experts from the Organization for the Prohibition of Chemical Weapons (OPCW) to investigate the reports. According to the Russian Defense Ministry, the three countries fired over 100 cruise and air-to-surface missiles, most of which were shot down by Syrian air defense. According to Damascus, which has repeatedly said it had eliminated its chemical weapons stockpiles, the attack damaged Syrian infrastructure, and left three civilians injured.